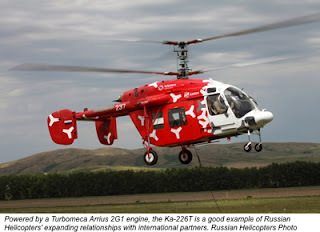 Russia - July 8, 2013 - Before the Russian government created Russian Helicopters on August 16, 2007, there were several Russian helicopter plants — including Mil and Kamov — each with its own website. Consolidation of these enterprises into one holding company was completed some time ago, but their individual websites remained online until March 11 of this year, when they were taken down to focus attention on Russian Helicopters’ consolidated website, www.russianhelicopters.aero. 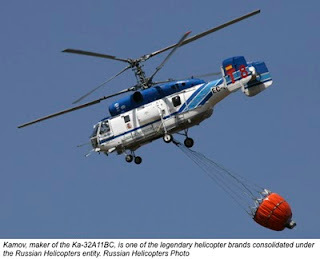 If you haven't seen the Russian Helicopters website, it’s worth a look. With an attractive modern design highlighting the company’s new name, logo and slogan (“Experience and Innovation”), the website is comprehensive and easy to navigate. The quality of Russian Helicopters’ online presence mirrors the quality of its products, which are appreciated around the world for being well-built, rugged and reliable. I recently had the opportunity to interview Roman Kirillov of Russian Helicopters about the Russian Helicopters website, and how it reflects the company’s broader approach toward integrating its legendary brands. Question. What is the thinking behind the formation of one Russian Helicopters company? Answer. Consolidating all of the Russian helicopter design and construction enterprises into one holding company makes great sense from a commercial point of view. By bringing together some of the world's most famous and most respected helicopter manufacturers, we were able to create a powerhouse capable of competing in the global marketplace. Russian-made helicopters are operating in more than 100 countries around the world, and account for about 14 percent of global helicopter fleets. Last year we were by a long way the market leader in Russia, also taking 14 percent of the market share of sales worldwide. Together we are much stronger, and are able to benefit from synergies between the strengths of our brands. Question. How has restructuring and putting all the Russian helicopter plants under one organization improved Russian helicopters? Answer. The great advantage of combining all of Russia's helicopter manufacturing assets into one company is that we have created a company that is more than the sum of its parts. Russian Helicopters today is a global powerhouse that offers the full cycle of helicopter manufacturing, from design and testing to the actual build and then subsequently the after-sales maintenance and service. We have achieved significant economies of scale, and are able to offer an unrivaled model range of helicopters, particularly in the medium class. Furthermore we are able to benefit from combining the expertise of some of the world's best-known design and manufacturing companies. An obvious example of this is the National Helicopter Building Centre that has been established outside of Moscow based on the Mil and Kamov bureaux. With our position of global strength in terms of sales we are also able to think globally regarding other aspects of our business too, this means areas such as after-sales service, where we are rolling out a global network of centers to provide maintenance and upgrade services to Russian built helicopters wherever they are flying in the world. Question. How did Russian Helicopters come up with the new Russian Helicopters branding, identity, logo and slogan? Answer. The Russian Helicopters logo is a simple and striking design that reflects what the company does. A modern company active in today's global marketplace. 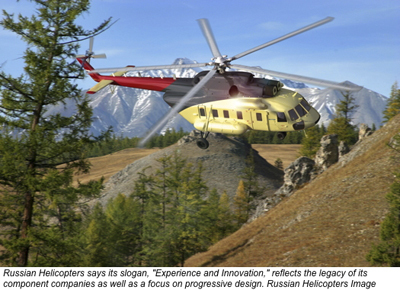 The slogan "Experience And Innovation" characterizes the company's activity: the companies that make up Russian Helicopters draw on more than 60 years of expertise in the design of modern and progressive helicopters by using the latest innovative technologies and cooperating with international partners. Question. Tell me about your new logo, what was the reasoning and inspiration behind this new logo? Answer. The logo is a dynamic and powerful reflection of Russian Helicopters that retains the recognition we have built up over the years while creating a new brand with a forward-looking, clean and modern style. It combines a circle and three helicopter blades, using asymmetry to create a dynamic effect. The typeface used for the name Russian Helicopters is the same as that in the logo of our parent company, Oboronprom, which creates a visual link between the two enterprises and strengthens the recognition of the brand. The color scheme used is also the same, for similar reasons. Question. When did Russian Helicopters actually launch their new website? Answer. The site was launched in 2010. Question. Tell me about the new Russian Helicopters' website and its purpose? Answer. The new website aims to be a single resource for operators of Russian Helicopters, potential customers and eventually investors, providing information about our company and our products and services. We are striving to meet the standards expected from a leading global company; this includes communication with all current and potential stakeholders in our business and anyone with an interest in Russian helicopter manufacturing. The Russian Helicopters website is continually being updated to reflect current trends. It is very popular with users from around the world, and is available in three languages — Russian, English and Spanish. Question. Have the names Kamov, Kazan, Mil, etc. gone forever? Will these names (and corresponding logos) ever be used again on newly made Russian helicopters? Answer. The names have certainly not gone forever. Russian Helicopters is extremely fortunate to be the owner of brands that can without exaggeration be described as legendary in the world of helicopter manufacturing. So it would be foolish, not to mention almost insulting, to the history of those great names to try to reinvent the wheel by creating something entirely new. We are very proud of our history, and will continue promoting Mil, Kamov etc. under one brand. Mike Hampson is the owner of Helicopter Links (www.helicopterlinks.com) based in San Diego, California, USA.